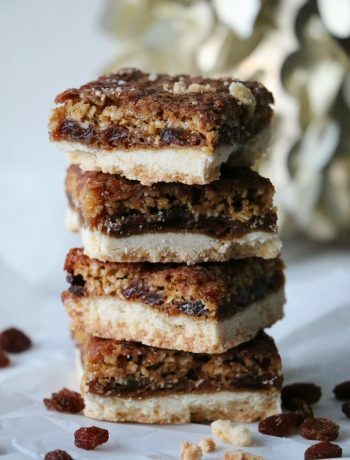 Long, cold Canadian winters always have me craving something comforting and familiar. 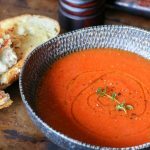 A nice hot bowl of tomato soup usually hits the spot but only if it is served alongside a grilled cheese sandwich. Not the kind made with thin white sandwich slices and processed cheese. I’m talking a nice hearty piece of sourdough, buttered and grilled to perfection, with an oozy goozy Fontina and Gruyère cheese centre, and a hint of garlic and some herbs. Mmmm. Writing about this has got my appetite up and running! 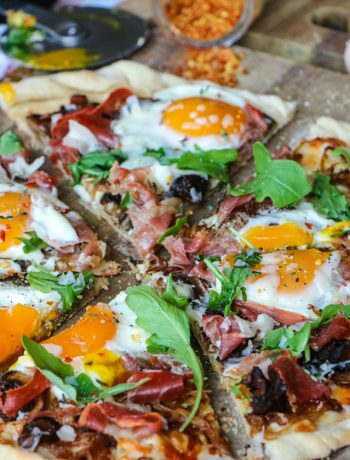 Almost everything in this recipe you can find in your pantry, which makes this recipe amazing because you don’t have to go to the store! If you don’t have fresh herbs you can definitely substitute out the fresh for dried, like I did with the basil. You can also switch up the cheese to your liking. Gruyère offers a delectably salty and nutty taste while Fontina adds the beautiful stringiness of what a traditional mozzarella would offer… but mozza is something we rarely buy… unless it’s fresh and we’re making pizza! But anyways back to the recipe talk. 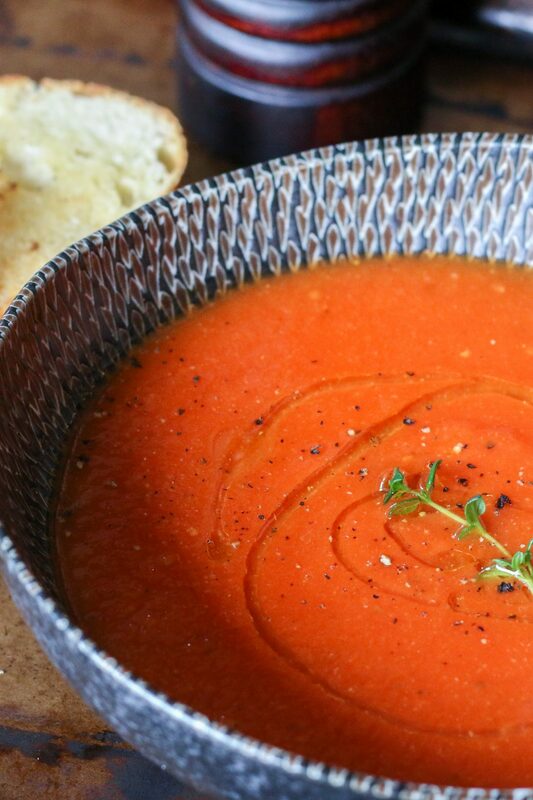 This tomato soup is so simple, seriously. Try it out. To make the soup just a bit more fancy I drizzled some truffle oil to finish the soup. Again, if you don’t have truffle oil on hand and you have a complementary flavoured herb oil, then go ahead and use that instead! The grilled cheese, well I think everyone knows how to make that! When I was younger I used to put original Ruffle chips in the middle of my grilled cheese sandwich. It is definitely an amazing combination, however since then I’ve grown up, I don’t butter my danish anymore, nor do I fill each waffle square with an ungodly amount of butter and maple syrup. But hey, if you’re feeling up for something different, go crazy and add some chips in your grilled cheese! 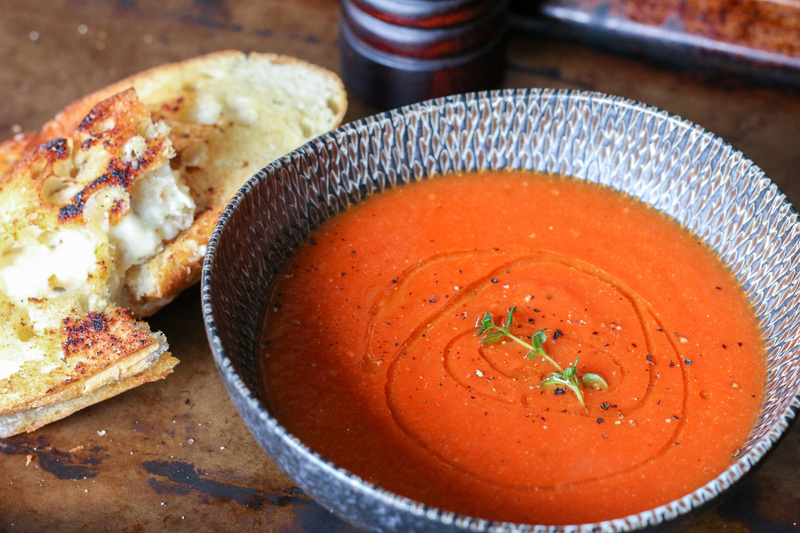 Tomato soup paired with a buttery grilled cheese sandwich is a classic combo especially on a cold day. Take this soup to the next level with a drizzle of truffle oil. For the soup: Heat oil in a medium sized pot, over medium-high heat and sauté onion and garlic for 5 to 10 minutes until softened and slightly brown. Add tomatoes, chicken bouillon paste, water, basil and red pepper flakes. Boil for 10 to 15 minutes.Using a hand blender, purée the soup until desired smoothness. For the grilled cheese: Heat a cast iron pan over medium heat. While the pan heats, generously butter the top and bottom of the sourdough slices. Place bread butter-side down on the pan, top the unbuttered side with several slices of cheese and sprinkle with seasonings (garlic powder, rosemary, and thyme). Top with remaining slice of bread, buttered side up. Cook until the bread is golden brown on the bottom, flip, and cook until the cheese is melted and the other side is brown, about 3 to 5 minutes per side. Cut in half. To plate: Ladle the soup into a bowl and garnish with a sprig of fresh thyme, fresh cracked black pepper, and light drizzle of truffle oil. Serve alongside grilled cheese sandwich.